The market was full of life this morning on account of the milder temperatures and wider range of plants and flowers that are now available, including colourful displays of Mimosa and Lilac already in flower in pots, and bunches of Cherry blossom to celebrate the Chinese New Year. 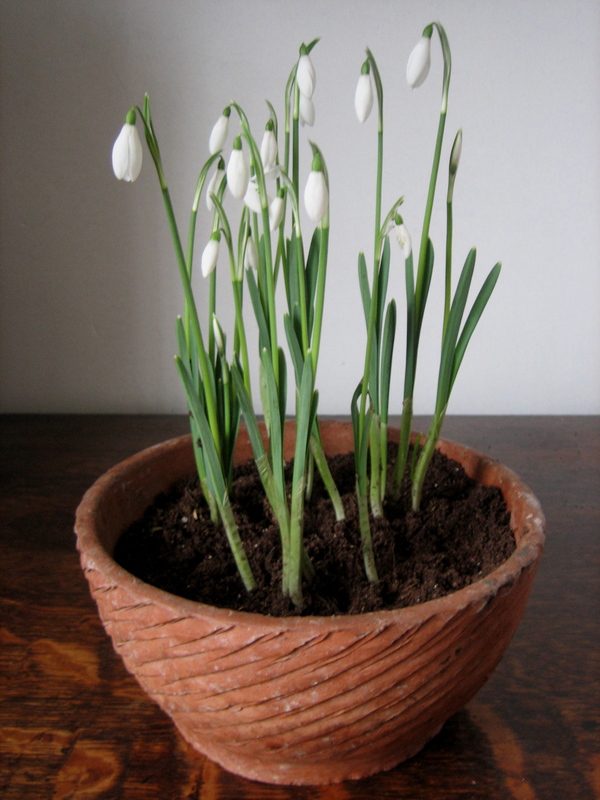 I opted for some Snowdrops (Galanthus nivalis) at four pots for a fiver and planted them in this old clay pot of indeterminate age that I dug out of the Thames mud at Strand on the Green, where I had the good fortune to rent a room in an eighteenth century house when I first came London as a young writer. The Snowdrops in my garden that I planted in-the-green last year are just beginning to show, so these will see me through until those outside come into flower. With my humble Snowdrops in hand, I had the pleasure of bumping into Cynthia Grandfield, the Queen of Ryantown, deliberating over which richly coloured flowers would best complement Lulu Guinness’ Columbia Rd Bag (featuring all the Columbia Rd shops along the side) which will go on display in the shop window today. I think I shall have to go back and take a look. You found your pot mudlarking! How wonderful.